Pedestrians and drivers passing by the intersection of Park Avenue and Navy Street in Fort Greene are in for a pleasant surprise this holiday season. 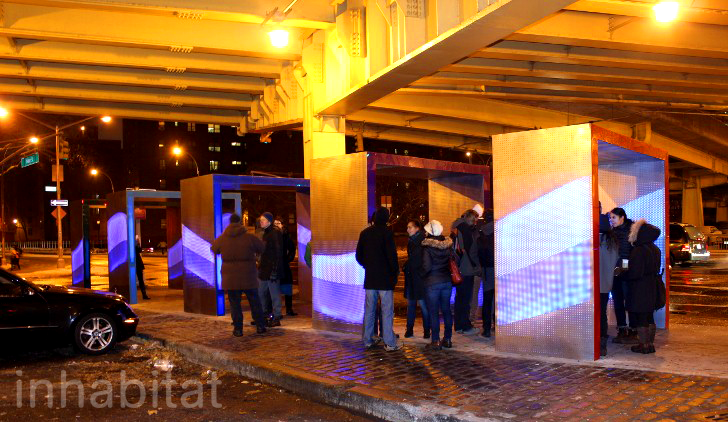 On Tuesday, Urban Matter, the NYC DOT and the Myrtle Avenue Brooklyn Partnership flipped the switch on Silent Lights, a new public art installation located underneath the Brooklyn Queens Expressway. The series of interactive gates is lit by 2,400 LEDs that respond to sounds picked up at the busy corner to turn them into ethereal light patterns for all to enjoy. The dazzling art installation was designed and built pro bono by Urban Matter with support from DOT Urban Arts Program, Artplace America, Black Rock Foundation, Brooklyn Arts Council, Awesome Foundation, Designers Lighting Forum of New York, Red Hook Initiative and the Myrtle Avenue Brooklyn Partnership. If you’re in the Fort Greene area, don’t miss your chance to walk through Silent Lights for yourself this holiday season! "Silent Lights is a series of sculptural gates that line a pedestrian pathway under the Brooklyn Queens Expressway," writes Artist Build Collaborative. "The gates are embedded with light and sound equipment: 2,400 LEDs and a microphone, controlled by an Arduino mega microcontroller. The installation uses these to respond to sounds from the street and transform it into beautiful light patterns. The light enhances this ordinary often overlooked public right-of-way, creating a playful, inviting, memorable space. It is also an attempt to revitalize some of the city’s millions of underutilized square feet of space under the New York street bridges and expressways." The dazzling art installation was designed and built pro bono by Artist Build Collaborative with support from DOT Urban Arts Program, Artplace America, Black Rock Foundation, Brooklyn Arts Council, Awesome Foundation, Designers Lighting Forum of New York, Red Hook Initiative and the Myrtle Avenue Brooklyn Partnership. If you're in the Fort Greene area, don't miss your chance to walk through Silent Lights for yourself this holiday season! The gates are embedded with light and sound equipment: 2,400 LEDs and a microphone, controlled by an Arduino mega microcontroller. The installation uses these to respond to sounds from the street and transform it into beautiful light patterns. The light enhances this ordinary often overlooked public right-of-way, creating a playful, inviting, memorable space. It is also an attempt to revitalize some of the city’s millions of underutilized square feet of space under the New York street bridges and expressways. The dazzling art installation was designed and built pro bono by Artist Build Collaborative with support from DOT Urban Arts Program, Artplace America, Black Rock Foundation, Brooklyn Arts Council, Awesome Foundation, Designers Lighting Forum of New York, Red Hook Initiative and the Myrtle Avenue Brooklyn Partnership. If you're in the Fort Greene area, don't miss your chance to walk through Silent Lights for yourself this holiday season!